This project is an Application/extension of Digital Pulse Counter. Transmitter Part: The transmitter circuit (see Fig. 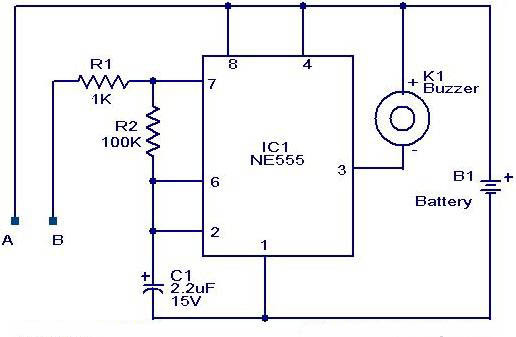 1) is built around timer NE555 (IC1), which is wired as an astable multivibrator producing a frequency of about 38 kHz. The infrared (IR) beam is transmitted through IR LED1. HERE A is +9V and B is GND. Receiver Part: There are two 7 segment displays driven by two CD4026B (CMOS DECADE COUNTER/DIVIDER) used here to count up to 99. Seven Segment display used are common cathode type(see fig below). Moving ahead when the transmitted signal is cut, Pulses are generated by the IR receiver TSOP1738. The output of TSOP1738 is then fed to monostable multivibrator circuit made using NE555. Then the controlled stable pulse of 250ms (T=1.1*R*C) is fed to CD4026B which will drive the unit place display to make it count from 0 to 9. When it overflows, carry is generated by this IC and this carryout is fed to another CD4026B driving Tens Place display . Thus making the whole circuit count 0 to 99. Similar CD4026 circuit can be added to increase the number of counts. 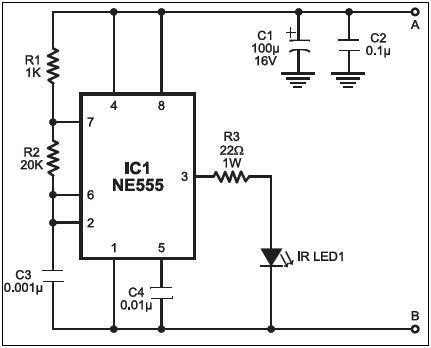 This Circuit has various applications such as spring oscillation counting, Counting no of people entering through door(one way), as a bugular alarm, etc. 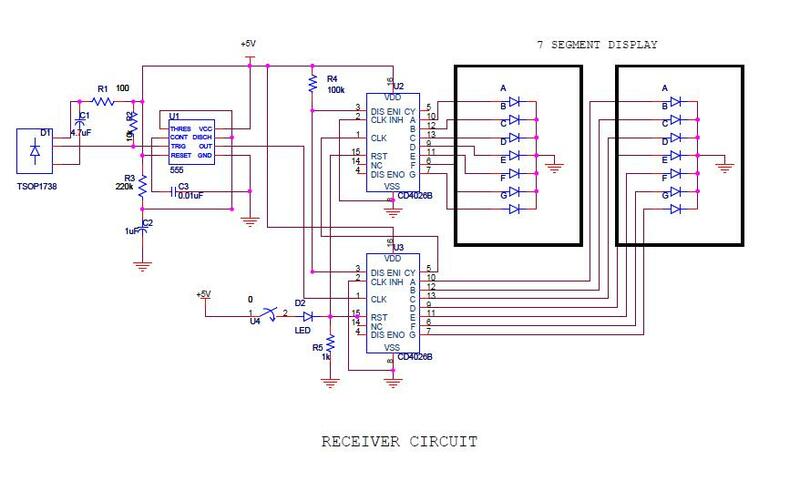 Here you can download the PDF Schematic of the receiver part. Here is a simple water level alarm circuit using 555 timer that will produce an audible alarm when the water level reaches a preset level. The circuit can be powered of a 3V battery and is very handy to use. The circuit is based on an astable multivibrator wired around IC1 (NE 555). The operating frequency of the astable multivibrator here will depend on capacitor C1, resistances R1,R2 and the resistance across the probes A&B. When there is no water up to the probes, they will be open and so the multivibrator will not produce oscillations and the buzzer will not beep.When there is water up to the level of probes, some current will pass through the water, the circuit will be closed to some extend and the IC will start producing oscillations in a frequency proportional to the value of C1,R1,R2 and the resistance of water across the probes. The buzzer will beep to indicate the presence of water up to the level of the sensing probes. The circuit can be powered by a 3-12V battery.